Deaths of law enforcement officers during the summer months (June, July & August) rose 10% in 2011 compared to the previous year. When compared to the 10 year average of 2000 through 2010, fatalities rose 4%. A total of 44 law enforcement officers were killed this summer, up from 40 in the summer of 2010. 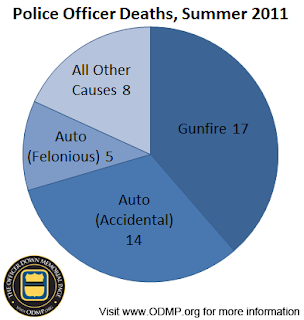 On average, 42 officers were killed during summer months in the preceding decade. More detailed information, including a complete break down of causes of death for all of 2011 or any previous year can be found by visiting the Officer Down Memorial Page.